Accept PayPal payments. Add PayPal button to your product pages or new payment option for the Order Form or Shopping Cart and allow the users to pay immediately for the order. This is a standalone extension. You don’t need any other extensions to enable a PayPal button on every product page with a price set. You can enable PayPal buy now button which redirects directly to the PayPal payment page. It supports the shipping feature. You can choose to use the PayPal Shopping Cart implementation. After the button is hit the cart appears in top layer and the user can adjust the quantity, delete products from cart, proceed to payment or continue shopping. This PayPal Gateway extension is fully compatible with Order Form or Shopping Cart extensions. The PayPal payment method will be added to the checkout form. This PayPal payment gateway will add a PayPal button to every product page with a price set. Also if you have the Order Form or Shopping Cart extensions the new payment method will be added to the form. The only field you need to configure to start getting payments is PayPal email address. You can enable PayPal sandbox and test the order and payment process. When sandbox is enabled the payments are not taken. For details see PayPal Sandbox. Be reliable, show your customers what they are paying for with exact order summary sent to PayPal. The customer can see product name, quantity and price before they confirm the payment. Provide fast and unique experience by pre-filling what was already provided on the website. Users don’t like long payment procedure. impleCode PayPal Gateway will send customer input to PayPal for you (if you are using the order form). You can configure the extension by adjusting a couple of simple settings. When new product is added the shopping cart appears as top layer. The shopping cart has all product listed with a possibility to modify the quantity, delete product, checkout with PayPal or continue shopping. The totals are updated instantly when the user changes the quantity. PayPal Gateway is fully integrated with impleCode Order Form. 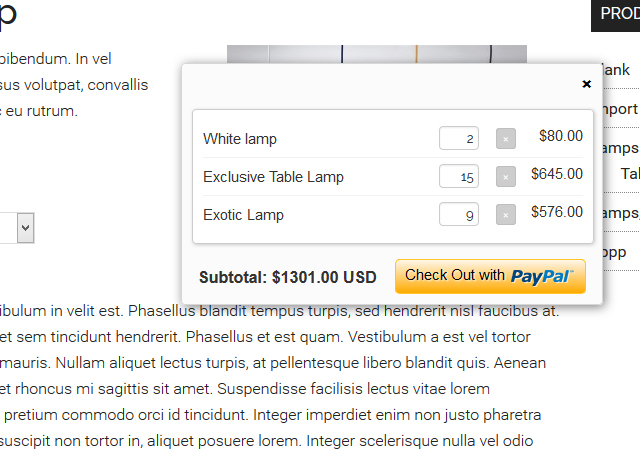 When both plugins are activated the Order Form Builder gets another setting to assign PayPal fields. When you assign PayPal fields in drag & drop form builder the correct data will be sent to PayPal. Order processing ready. First step of payment verification is done by the Gateway. User is sent to the thank you page after the payment is done. PayPal Gateway let you process digital product order after the payment is verified. EU orders integration let you define VAT for the order. It will be specified in the order summary on PayPal. 100% compatible with Product Discounts extension. 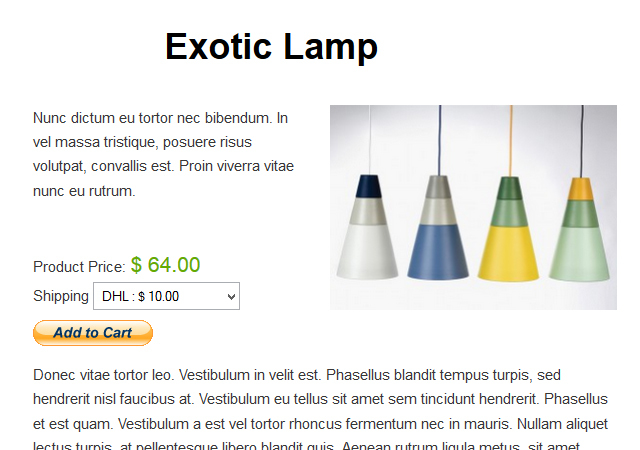 100% compatible with eCommerce Product Catalog shipping. This impleCode Order Form extension is a WordPress plugin, which you can upload and install through your WordPress dashboard under the Plugins menu. Do I need SSL certificate or PCI compliance in order to use this plugin? No. SSL certificate and PCI compliance is not required to get payments with this plugin. Payment processing is done by PayPal secure servers and the plugin is handling all the security for the checkout process. 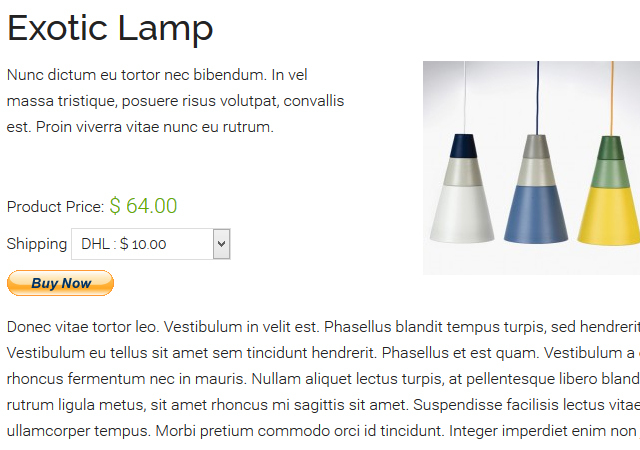 Do I need Order Form or Shopping Cart plugins to get payments? No. You can get payments through PayPal button automatically generated on the product page.